Father’s Day is fast approaching. This year it is on Sunday 17th June. And now is the perfect time to start planning and purchasing the gifts. I have put together a selection of some of mine and Mr.H's favourite gifting options. So, if you're stuck for gift ideas, have a look at the guide. It features products for every budget and I hope it will help those of you who are struggling for ideas. Mr.H is very particular about his clothing and only picks stuff that matches his quality and style criteria. Recently he got the chance to pick a piece of clothing from Dobell and he was left impressed. There was so much choice and after much deliberation he picked a Dark Blue Herringbone Tweed Jacket. For those of you who haven't heard of Dobell, they are a leading online formal wear store for men and boys of all ages. On their site you will find an extensive range of tuxedos, men’s suits, shirts, shoes and accessories from brands like Paul Costelloe, Tommy Hilfiger, Noose & Monkey, Esprit, Lambretta, Paul Gross, and Alexander Dobell (their in-house label). Dobell specialises in fine tailoring (in-house) and being online only they are able to offer quality products at affordable prices. Coming back to the jacket that Mr.H picked; it is a wool blend, single breasted, tweed jacket and makes a nice addition to Mr.H's smart casual wardrobe. It is of an excellent quality (great material), very well tailored and has a comfortable fit and at a price of £89.99 it is a steal! And Mr.H looks quite dapper in it. If you are looking to buy your dad (or any other man in your life) a quality jacket at an affordable price, check out the collection at Dobell. Dove have a number of affordable gift sets featuring products that will help your dad look and feel his best. First up is the Men + Care Trio Gift Set which contains Dove Men+Care’s Clean Comfort Body & Face Wash, Clean Comfort antiperspirant and Extra Fresh Body & Face Wash. All the products are formulated with MicroMoisture technology, which activates when lathering and helps protect against dryness and skin irritation and they are 100% designed for men. Wilkinson has a number of inexpensive and stylish grooming products like the Hydro 5 Groomer (a 4-in-1 styling tool) priced at £14.99, the Hydro 3 (priced at £7.99) or the Hydro 5 Sense Razor featured in this round up. The Hydro 5 Sense makes use of a shock-absorb technology which auto-adjusts the amount of pressure it is putting on the face, giving the user the ultimate customised shave. My brother has used this and according to him the razor is comfortable to hold and manoeuvre across the face. It gives a good close shave without having to go over an area many times. It also has a flip trimmer for precise trimming. If you are looking for a personalised gift for Father's Day, then I would recommend checking out www.findmeagift.co.uk. They have an impressive range of bespoke presents for dads like personalised tools, message in a bottle gifts, photo gifts, novelty mugs and personalised alcohol gifts like the one featured in this guide. If your father's favourite tipple is Scotch then this bottle of personalised Malt Whisky would make a wonderful gift for him. There is a choice of two malts - a premium 12 year old Single malt whisky or a top quality Single malt Scotch whisky, which has been matured in specially selected oak casks! Whichever option you choose, you can have it personalised and also pick from one of the two presentation boxes available - either a gold gift carton or a silk lined gift box. As you can see from the photos, I chose the silk lined gift box and it is fabulous! I ordered this for my husband and he loved it; such an excellent gift idea according to him. The packaging was luxurious and the personalisation made it even more special. Mr.H says he is going to retain the bottle once the whisky is finished and fill it up with his regular whisky! I would too, if the bottle had my name on it :) An excellent keepsake! If whisky is not your dad's favourite tipple, you can check out FindMeAGift's collection of other alcohol gifts including beer, wine as well as a variety of drinking accessories many of them with the option of personalisation. Do check them out! For the dad who loves the clean shaven look, Braun's Series 5 5197cc would make an excellent gift. The electric shaver gives efficiency in every stroke, shaving even dense beard and reaching difficult areas. The razor is 100% waterproof and has designed to last up to 7 years. Some of the key features of this model include: an AutoSensing motor that reads the beard and constantly adapts to its density for an efficient and comfortable shave, an 8 direction comfort head that offers flexible shaving even in difficult areas, an ActiLift Trimmer that captures flat-lying hair and hair growing in different directions. Cool! In addition it features 2 SensoFoil™ blades that shave as close as 0.058mm and perfectly protect the skin for lasting smoothness. An excellent shaver it is. And it deserves suitable cleaning and care which is offered by the included Clean&Charge Station. According to Braun, it is world’s only 3 action alcohol based Clean&Charge station that removes 99.9% of germs making it 10x more hygienic than under running water. This Chrome Edition razor from Gillette features 5 anti-friction blades for a close and comfortable shave and a chrome effect handle that adds to the style. Featuring Gillette’s FlexBall technology, ProGlide responds to contours and gets virtually every hair. There is also a Precision Trimmer on the back that is great for those hard-to-reach, tough areas such as under the nose and sideburns. The razor also has an enhanced Lubrastrip with more lubricants for a smoother shave. And 1 men’s razor blade refill lasts up to one month of shaves; which is excellent. You can pick up the Gillette Fusion5 ProGlide Razor Chrome from Boots.com. The Samaris Mid Hiking Boots with a streamlined, lightweight structure are excellent for hiking. The boots are well-made with endurance mesh uppers that are engineered with extra space around the toes to allow for natural movement on climbs. This is an excellent feature for those who need extra room around the toes. The boots have 'Hydropel' technology that efficiently disperses mud and water and a waterproof/breathable Isotex membrane that keeps feet dry inside and out. Mr.H has been using these boots for many months now and he has found them very comfortable and the boots have performed well on all kinds of terrain - from paved paths to boggy puddles to rocky mountain trails. The grip has been good. This could be attributed to the hardwearing carbon outsole and a multi-directional cleat pattern that delivers excellent traction and shock absorption on and off the trail. If your father does a lot of walking, then a good pair of boots are extremely important and this pair from Regatta would be a good choice. According to the makers of the Globenfeld watch The new-and-improved Super Sport 2.0 features a simple-to-adjust metal band and has been perfected to suit a gentlemen with a larger build. The watch includes a dual analogue/digital display, 12/24 time formats, alarm with chime, stopwatch/timer with lap/reset, and backlight function for night vision making it an excellent choice for someone with an active lifestyle. The watch though heavy has a sleek design that features a stunning dial framed within a contrasting Tachymeter. Steel arrow hands and three windowed dials with a matching metal band create a classy look. The list of features doesn't end there - the watch has a scratch resistant mineral crystal glass that keeps the case protected and a simple-to-adjust metal band that provides all day comfort. The watch like all other Globenfeld offerings has a 60-day money-back, no-questions-asked guarantee. There is also a platinum warranty for a period of 5 years from the date of purchase. A very useful gift for the dad who loves watches. 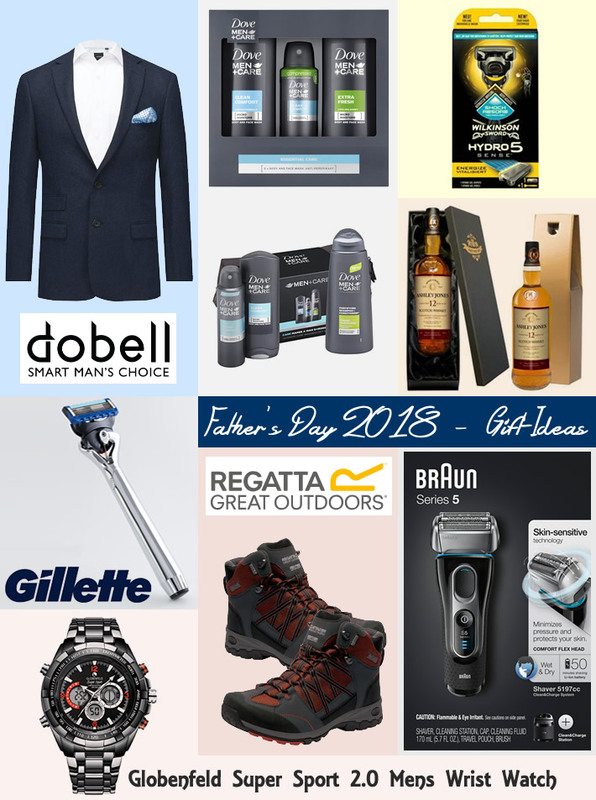 So there you have it, the DB Reviews gift guide for Fathers Day 2018. I hope that you have found some gifting inspiration from the guide.